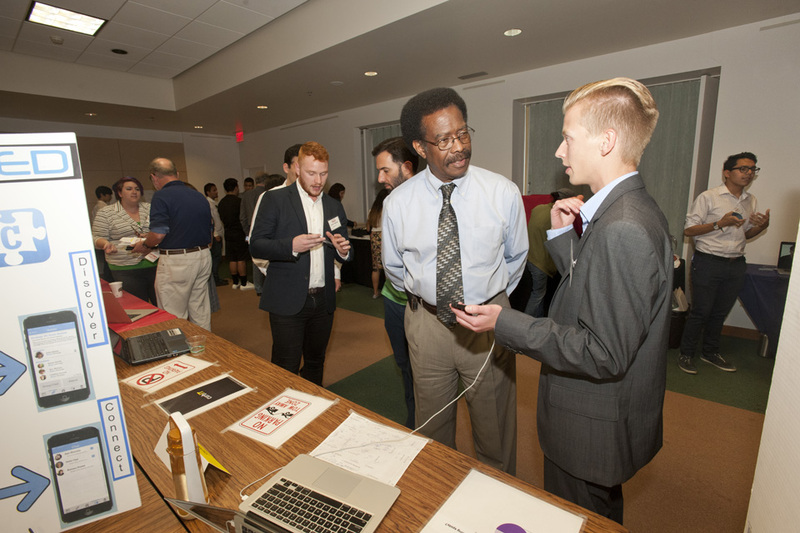 AppJam 2016 gives CSUN students the opportunity to present apps that they have created in a competition that could net them a cash prize for the development of their app. Photo by David Hawkins. When Rafael Munoz recalls his time at the Layer 8 Computer Security Club at California State University, Northridge, he feels proud and thankful. In March, Layer 8 won the Western Regional Collegiate Cyber Defense Competition, defeating seven other schools — including Stanford, Berkeley and Cal Poly Pomona. Through his work in Layer 8 and events such as the regional competition — where students were in charge of the administration and security of an information technology system and had to resist cyber attacks — Munoz enhanced his skills in cybersecurity and landed a job as a security assessment engineer at Technicolor, the Burbank-based entertainment and media company, after graduating. Munoz’s CSUN experience is just one example of the tech talent developed at the university, leading Bixel Exchange to rank CSUN among the top 10 schools producing tech talent in the Los Angeles area. In its inaugural ranking in mid-November, Bixel’s Sector Report on the Information Technology (IT) Industry named CSUN No. 2 for bachelor’s degrees and No. 3 for master’s degrees. Bixel Exchange is a center for innovation and technology based at the Los Angeles Area Chamber of Commerce and the Los Angeles Small Business Development Center. The organization seeks to support startups and helps connect entrepreneurs and students with investors. Evaluating data from LinkedIn’s career portal, Bixel Exchange analyzed educational trends in the local tech industry. The research found that the California State University system — and CSUN in particular — produces well-prepared workers for the tech industry. “CSUN’s Department of Computer Science and Department of Accounting and Information Systems have a strong partnership, which allows us to provide the students with a broad suite of IT-related degrees,” said Paul Lazarony, associate dean of the Nazarian College. The connections between technology and business are integral factors in today’s workforce, Lazarony said. “Big data and data analytics are not just important for the tech industry, but also help to make better business decisions,” he said. Big data refers to very large and diverse data collections that are too big to handle without advanced analytics techniques. Data analytics refers to the examination and analysis of such information. Tech firms look for entrepreneurial students, Cours said. Venture competitions, such as the CSUN Fast Pitch and Bull Ring, and the Los Angeles Cleantech Incubator, give students opportunities to gain skills in pitching business ideas and launching startups. Munoz took advantage of the resources CSUN offered and said he recommends future Matadors do the same.